Macquarie University's medical program is new, full fee paying and is a postgraduate degree, so you need to have completed previous university study if you want to do medicine at Macquarie. There is, however, an undergraduate path through the Bachelor of Clinical Science degree at Macquarie that provides either direct entry to the postgraduate Doctor of Medicine for certain students or a path to apply for the Doctor of Medicine for others. Path 1: Bachelor of Clinical Science/Doctor of Medicine (Macquarie). The Bachelor of Clinical Science/Doctor of Medicine combined package program is available for international students. The requirements for this degree, in terms of academic achievement, is an ATAR or equivalent of 95 (min). There are no prerequisite subjects for this combined degree though students are assumed to have maths and chemistry (at Band 4 level) and if they do not there are options available to undertake bridging studies in these areas. Path 2: Bachelor of Clinical Science (Macquarie). Domestic students are able to undertake the Bachelor of Clinical Science degree. This has an ATAR of 90 (min). There are no prerequisite subjects required for this degree though as with Path 1, students are assumed to have maths and chemistry (at Band 4 level) and if they do not there are options available to undertake bridging studies in these areas. This path is known as the Indirect pathway for domestic applicants. There are no prerequisite undergraduate degrees and no requirement for degrees to have been completed at Macquarie University, so this means if you have a degree from any recognised university, you are able to apply. The proviso is the qualification must be less than 10 years old and students need to have completed courses in human anatomy and human physiology at a level that satisfies Macquarie’s prerequisite requirements. As for any undergraduate degree, Macquarie assess ATAR and have a minimum English requirement for the Bachelor of Clinical Science/Doctor of Medicine degree. In addition to this, applicants are required to undertake the Macquarie University screening test known as CASPer. achieved a GPA (min) of 5.5 out of 7 in the professional practice units. Stage 1: as part of the application process, Macquarie require the submission of a Personal Statement. This involves students providing responses to 3 targeted questions pertaining to the medical program. Macquarie use the Personal Statement as a hurdle assessment and then ranks applicants for interview based on their combined GPA (50%) and MCAT/GAMSAT (50%), to determine who's offered an interview. 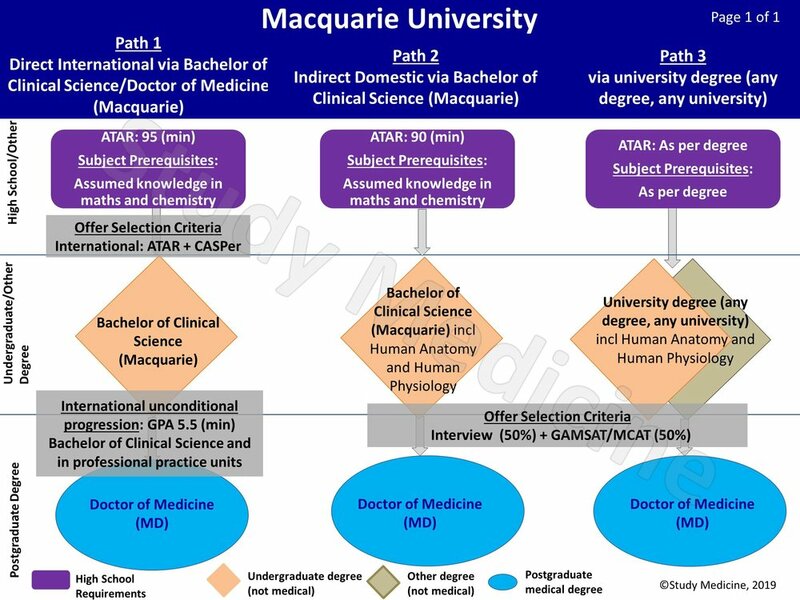 Stage 2: Your Interview (50%) and GAMSAT/MCAT (50%) results are combined to determine who's offered a place in Macquarie's University's medical degree. Any ties are separated using applicants' GPAs.